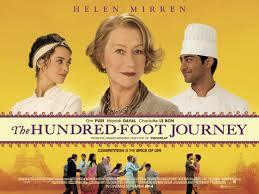 I’m not typically one to write movie reviews, but last night I had the great pleasure of seeing the movie “The Hundred Foot Journey,” which is based upon the novel by the same name written by Richard C. Morais and stars Helen Mirren, and to say it was fantastic would be an understatement. It was a tremendous, thoughtful movie that really struck a chord with me personally on many levels. Beyond that, it was a beautiful movie filled with incredible food, which I’m certain will appeal to any self proclaimed foodie. The premise of the movie is that a family from India, through a series of unfortunate circumstances ends up in a small village in France, where they end up opening an Indian restaurant directly across from a Michelen starred French restaurant. Without divulging too much of the plot, there is a love story, the ascendance of a great chef, and ultimately the return of that chef to his adopted home town and to his roots. For myself, the part of the movie that struck the greatest chord was the fact that this young man, through hard work and talent, was able to achieve greatness in an industry that traditionally rewards those who have attended big name culinary schools. As a self taught chef, who has spent a lot of time studying and has also ultimately received her certification as a Culinary Professional through the International Association of Culinary Professionals, I can understand and recognize the difficulty of breaking into this kind of old boys club, even more so as a female in a profession largely occupied by men. The second aspect of the film that struck a chord with me was the dynamic and sometimes violent nature of inter-cultural relationships. We see so much hatred and war going on right now between people of different religions and cultures. In this movie, some of the locals in the French village are resentful of the differences that the Indian family represents and resort to violence to make their point. The owner of the French restaurant, after indirectly inciting the violence with her vitriol, puts them in their place by reminding them that the French constitution is based upon the foundation of “liberte, egalite et fraternite” or libery, equality and fraternity. These are principles that she believes should be extended to anyone wishing to make a home in France, that is willing to work hard and become a part of their community. I have a particular affinity to this kind of mindfulness. As someone who is deeply pained by the violence often attributed to social and cultural differences, I was happy to see her stand up for the “others” in this movie, discover the error of her ways and atone for them. A third aspect of the movie that really hit home with me was the notion of aspiring to fame or being known in the big time. That certainly has it’s advantages in terms of financial rewards, flexibility to travel, notoriety, etc. But many of these things come at a huge cost. I have often wondered what it would be like if I could make it big time, become a celebrity chef and have my own show on the Food Network. How things would change. How I wouldn’t have to worry about money anymore. How everyone would know me and I’d have a bigger platform to talk about healthy eating, organic/local foods and eating with dietary restrictions. All that would be great. But the flip side of that can include a lot of loneliness, answering to others, lack of independence and ultimately it can mean compromising your ideals and your passions. In the end of the movie, the lead character realizes this and returns back to his little village to cook the food he believes in at the French restaurant alongside the girl he loves. That is what I do here at CSI and it’s something I am very proud of. It certainly reinforces why I do what I do, where I do it, with the person I love. A couple of final thoughts on the movie that I found of interest. The Michelin star system in and of itself is a fascinating, if not slightly bizarre, rating system. It has existed forever and I realize that it is of huge importance, particularly to the French. In fact, there are stories of French chefs committing suicide because their restaurant lost a star. The notion that a newbie could possibly ascend the ranks of Michelin starred chefs so quickly is a little far fetched, but I will give the story brownie points for being a super Cinderella esque rags to riches story. I also had a small beef with the fact that the young woman at the restaurant, who had put in time working there, had experience and was equally as talented, was not offered the position as chef de cuisine when the male chef de cuisine was fired. In my ideal world, she would have been promoted, created amazing food herself, and gotten the second Michelin star for the restaurant, but realistically speaking, this is still a very male dominated industry, particularly in France, so I suppose I shouldn’t be too overly surprised. Ultimately, I do have to say that I loved the movie, I look forward to seeing it again in the theater, and I am certain I will own it. It was touching, inspiring, hunger inducing and funny. And it points out the one universal truth that is common among us all. We all have to eat. That should be the tie that binds us, not that pulls us apart. If there is nothing else that can bring us together in such a fractured and often violent world, it should be sitting around the table and enjoying a meal together. Go see it. You won’t regret it.